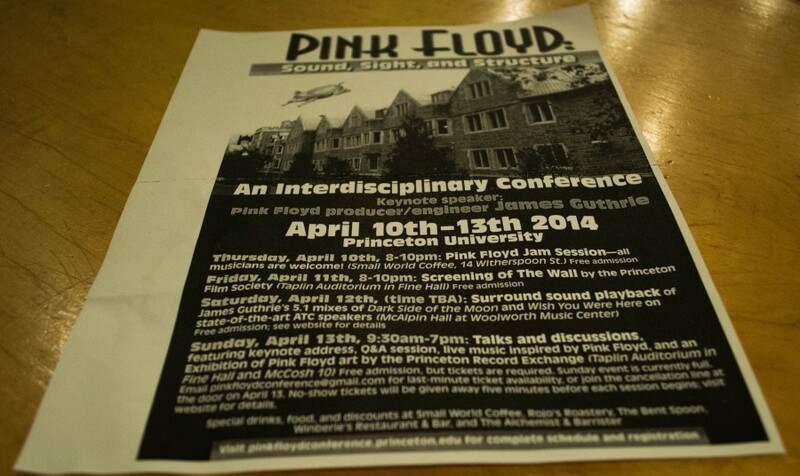 Pigs were flying around Princeton University and in the Garden State Thursday night (April 10th) as organizers of the University's interdisciplinary Pink Floyd conference launched the multiday event with an open jam session ("If We All Pull Together: Pink Floyd Open Jam") at Small World Coffee. The café sits adjacent to the University campus, in the downtown Princeton, New Jersey area, about an hour southwest of New York City. As previously reported by Brain Damage, a number of events, including a screening of "The Wall" and academic presentations analyzing the music and history of Pink Floyd will follow on the campus itself through this weekend. Pink Floyd producer and engineer James Guthrie will also host a "special world-premiere of his just-finished 5.1 mix of Roger Water's Amused to Death on state-of-the-art ATC speakers". Guthrie will deliver the keynote speech. The jam session featured not only those who have organized the conference but members of the audience who brought their own musical instruments and rotated in musical duties throughout the set: a successful endeavor that gave those in attendance a greater sense of intimacy and integration than an ordinary jam session normally impels – particularly in a well-attended, small venue that included regular patrons, curious visitors, and die-hard Pink Floyd fans, as well as friends, colleagues, and relatives of those organizing the conference. The set spanned the Syd Barrett and Roger Waters eras. Selections included "A Saucerful of Secrets", "Money", "Comfortably Numb", "Wish You Were Here", and "Another Brick in the Wall (Part II)", among others. Upon walking in, as the band jammed, it felt like type of performance typically captured in vintage footage from a Pink Floyd documentary; as the set unfolded you got a sense of the breadth of well-trained musical backgrounds that were contributing to the performance. A jazzy vibe that would make Nick Mason proud pierced through the otherwise down-to-earth and fairly loyal deliveries on occasion. The enthusiasm was palpable: as fans left the Small World Coffee shop you got the sense they have been thirsting for something like this for quite a long time (Pink Floyd conventions and conferences are not that easy to come by). That the conference tackles the art and history of Pink Floyd from an academic perspective makes the event a particularly important one. Interest in the event has, apparently, been ample. Organizers have had to spread presentations and events to accommodate the demand, quickly but efficiently shuffling things around just in time.